Tag line: "Come Out and Play"
In my review of 2012’s Stitches, a horror / comedy from Ireland about a killer clown, I mentioned that those who are normally afraid of clowns will still probably enjoy the movie. When it comes to 2013’s All Hallows’ Eve, the exact opposite is true: If you don’t like clowns, you’ll want to steer clear of this one. In fact, even if they don’t scare you, odds are they will by the time the movie’s over! The fun begins when two young siblings, Tia (Sydney Friehofer) and Timmy (Cole Mathewson), return home from a night of trick or treating. While looking through his bag of candy, Timmy discovers a videotape, with no markings, that someone dropped into his bag. Despite the protests of the kid’s babysitter, Sarah (Katie Maguire), Timmy pops the tape into the VCR and finds it contains a trio of short horror films, all featuring, in one way or another, a mute, sadistic clown (Mike Giannelli). In the first movie, a girl (Kayla Lian) sitting in a train station is drugged and taken to an underground facility, where she encounters a bizarre satanic cult. The second short deals with an alien abduction, in which Caroline (Catherine A. Callahan), who’s home all alone, is trying to evade an aggressive alien being (Brandon deSpain) that’s made its way into her house. In the third and final movie, the clown (lovingly nicknamed “Art the Clown”) takes center stage, brutally murdering a gas station attendant (Michael Chmiel) before stalking a young woman (Marie Maser) who inadvertently witnessed the crime. But when the tape finally reaches its end, Sarah and the kids discover their evening of terror is, in fact, just beginning. With segments shot as far back as 2008, All Hallows’ Eve is both a horror anthology and a showcase for the work of writer / director Damien Leone. Of the three shorts found on the video, the first, released in 2008 and titled The 9th Circle, resembles Rosemary’s Baby in more ways than one, and, while definitely the least memorable of the trio, does feature a few authentic scares. Film #2, the alien abduction, is the most recently produced; a nifty blend of sci-fi and horror with a solid performance by Catherine Callahan and an alien creature that’s pretty damn menacing. 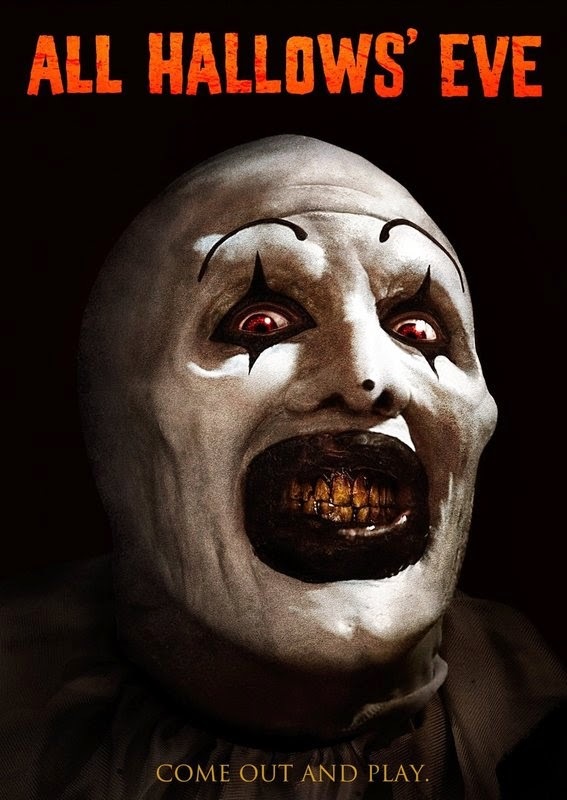 The third short, a 2011 entry titled Terrifier, is positively gruesome, a straight-up slasher with lots of gore and a killer you won’t soon forget. In a nice twist, the framing story is every bit as intriguing as the three main flicks, with all sorts of tension setting in once the kids scurry off to bed. With hundreds, if not thousands, of independent horror films produced over the last 10-15 years, it’s a real challenge to find the ones that are worthy of your time. Well, All Hallows’ Eve is absolutely worthy. It ranks up there with Stitches and Stake Land as one of the most entertaining indie offerings I’ve seen in a while, and based on his work here, I’m looking forward to what Damien Leone comes up with next. I'm definitely watching that one.